Corporate treasurers have been driving the bull market in stocks, not retail and institutional investors. The Fed’s Flow of Funds data show that net issuance of corporate equities over the past year through Q3 was minus $274 billion. In other words, buybacks well exceeded gross issues. Nonfinancial corporations registered net buybacks of $419 billion, while the financial sector had net issuance of $119 billion and foreign corporations issued $25 billion, according to the Fed’s data. The financial sector data include stock issuance by all ETFs, which rose to $174 billion over the latest four-quarter period. Excluding these ETFs, net issuance by financial corporations was minus $55 billion. The Fed also compiles monthly data for total gross equity issuance. Over the past 12 months through October, corporations raised $152 billion. However, that was overshadowed by buybacks. Data available for the S&P 500 show that they totaled $406 billion over the past four quarters through Q2. I was talking to CDO managers in mid-’05 that were saying how rich sub-prime MBS was and how wrong everyone was for buying that stuff at the spreads they were. To a man, they all agreed they were paying too much for the risk, they all believed that HPA [ED: home price appreciation] was going negative soon. But, sadly, they had to buy the stuff because they needed to accumulate collateral for their CDO issuance. F*&%, we all knew we were overpaying, even back in 2005. We knew it was essentially a bet that home price appreciation was going to continue at levels that couldn’t be sustained. No way that could keep going on. So why did they keep buying? The answer is quite simple: DEAL FEES. I gotta keep buying collateral, in order to keep issuing these transactions as a CDO manager. Its my job: I gotta keep accumulating collateral, and I gotta issue the liability against that collateral. Investment based on genuine long-term expectation is so difficult to-day as to be scarcely practicable. He who attempts it must surely lead much more laborious days and run greater risks than he who tries to guess better than the crowd how the crowd will behave; and, given equal intelligence, he may make more disastrous mistakes. There is no clear evidence from experience that the investment policy which is socially advantageous coincides with that which is most profitable. It needs more intelligence to defeat the forces of time and our ignorance of the future than to beat the gun. Moreover, life is not long enough; — human nature desires quick results, there is a peculiar zest in making money quickly, and remoter gains are discounted by the average man at a very high rate. The game of professional investment is intolerably boring and over-exacting to anyone who is entirely exempt from the gambling instinct; whilst he who has it must pay to this propensity the appropriate toll. Furthermore, an investor who proposes to ignore near-term market fluctuations needs greater resources for safety and must not operate on so large a scale, if at all, with borrowed money — a further reason for the higher return from the pastime to a given stock of intelligence and resources. Finally it is the long-term investor, he who most promotes the public interest, who will in practice come in for most criticism, wherever investment funds are managed by committees or boards or banks. For it is in the essence of his behaviour that he should be eccentric, unconventional and rash in the eyes of average opinion. If he is successful, that will only confirm the general belief in his rashness; and if in the short run he is unsuccessful, which is very likely, he will not receive much mercy. Worldly wisdom teaches that it is better for reputation to fail conventionally than to succeed unconventionally. Every 100 pounds Sterling would have grown to 1,675 – 22 years later. The same money invested in an index of UK stocks would have grown to 424 sterling. This during a period encompassing the Great Crash of 19129, the Great Depression, and the Second World War. Keynes recognized the potential of an asset class no one wanted to invest in, equities. He took advantage of the many inefficiencies by concentrating in companies he knew best with bottom-up company-specific research. He focused his efforts and concentrated his positions. That approach sometimes left him taking a beating, suffering a 23% loss in 1938 when the stock market was down only 8.6%. Keynes had a very rate quality. He never lost intellectual confidence needed to make contrarian investments. But he could see when he had made a mistake, deal with it, and modify his behaviour. Ironically, he ignored his macro-economic policies and forecasts which current economic policy makers can’t seem to do even after years of devastating effects. A summary of the above academic paper is presented below. Abstract: Keynes made a major contribution to the development of professional asset management. 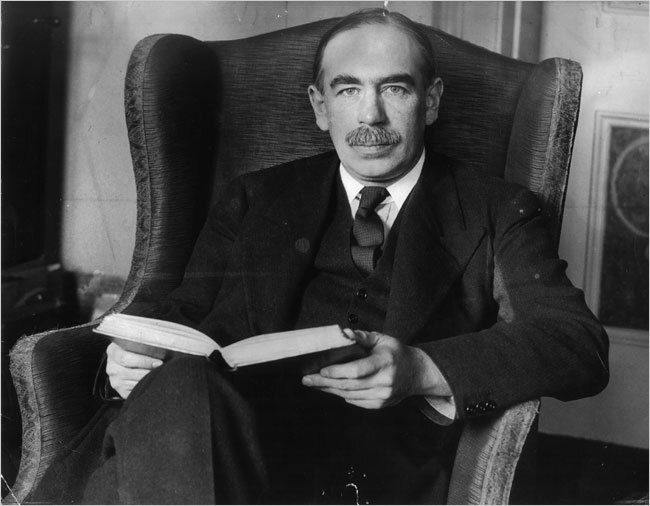 Combining archival research with modern investment analysis, we evaluate John Maynard Keynes’s investment philosophy, strategies, and trading record, principally in the context of the King’s College, Cambridge endowment. His portfolios were idiosyncratic and his approach unconventional. He was a leader among institutional investors in making a substantial allocation to the new asset class, equities. Furthermore, we decipher a radical change in Keynes’s approach to investment which was to the considerable benefit of subsequent performance. Overall, Keynes’s experiences in managing the endowment remain of great relevance to investors today. Conclusion: This study of Keynes’ stock market investing offers both a reappraisal of his investment performance and an assessment of his contribution to professional asset management. The King’s College endowment permitted Keynes to give full expression to his investment abilities. We provide the first detailed analysis of his investment ability in terms of his management of the King’s portfolios. Previous studies had claimed that Keynes’s performance for his college was stellar. Our results, however, qualify this view. According to our event time analysis, the changing pattern of cumulative returns around his buy and sell decisions before and after the difficult early 1930s, provides evidence to substantiate Keynes’s own claims that he fundamentally overhauled his investment approach. Essentially, he switched from a macro market-timing approach to bottom-up stock-picking. Furthermore, Keynes’s experience at King’s foreshadowed important developments in modern investment practice on several dimensions. Firstly, his strategic allocation to equities was path-breaking. Not until the second half of the twentieth century did institutional fund managers follow his lead. His aggressive purchase of equities pushed the common stock weighting of the whole endowment’s security portfolio over 50% by the 1940s. This was as dramatic and far-sighted a change in the investment landscape as the shift to alternative assets in more recent times. Secondly, his willingness to take a variety of risks in the King’s portfolio and to depart dramatically both from the market and institutional consensus exemplifies the opportunity available to long-term investors such as endowments to be unconventional in their portfolio choices. Thirdly, the contrast between the receptive environment at King’s and the conditions he faced at other institutions reminds us of how critical, conditional on possessing investment talent, is the right organizational set-up. Talent alone is not enough. Equally, his achievements underscore the main finding of Lerner, Schoar, and Wang (2008) in their analysis, two generations later, of the leading Ivy League endowments that such idiosyncratic investment approaches are very difficult for the vast majority of managers to replicate. Editor of CSInvesting: I may think of Keynesian Economics as daft (http://archive.mises.org/5833/the-failure-of-the-new-economics/), but we can all learn from this investor. I am puzzled by the performance graph as compared to the S&P 500; the Index, not including dividends, is flat for the year. How can the performance of so many money managers be so negative? Fundamental investors (whoever they are?) are down 20% or more! Thoughts? 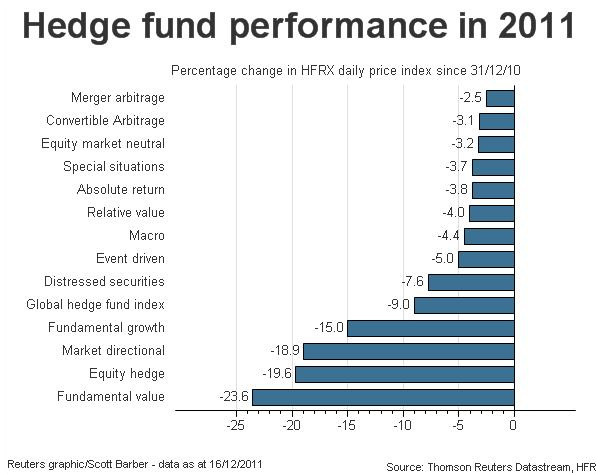 My guess is that managers had to liquidate on the violent sell-offs throughout the year due to client redemptions. Are there any lessons here? If a money manager had simply held stocks and done nothing all year, clients’ accounts would be in the black with dividends included. Interest rates in a gold coin standard: http://lewrockwell.com/north/north1075.html An article on understanding interest rates. What would interest rates be under an expanding economy with no currency debasement? http://mjperry.blogspot.com/2011/12/atlantic-most-important-graphs-of-2011.html Click on the links within this article. Remember correlation is not causation. Can I hear your Primal Scream?